But how do you find a hamster-approved bedding that meets these criteria? You could buy and test a variety of brands yourself, or you could check out our list of carefully selected choices that are sure to keep your hamster safe and happy while eliminating foul odors from their cage. No matter which option that you decide to go with, you’ll still want to clean your cage on a regular basis in order to set a good standard of cleanliness. It may smell before you realize it too, if you become used to the smell, so just keep that in mind if you’re having company. This bedding is made using recycled paper approved by the FDA. It has a soft and fluffy texture making it an ideal choice for pet hamsters who are known for burrowing and building nests. It claims to be 20% more absorbent than its competitors and is virtually dust free (99%). Dust isn’t ideal, but a tiny amount of it isn’t the end of the world, especially since a lot of it will sink to the bottom of the bag, so once you get near the end of the bag, don’t worry about using up every last little bit. Too much dust can be harmful for the respiratory systems of small animals, but this bedding is safe. It’s absorbent and controls unpleasant odors well, so you won’t need to frequent cage maintenance. It’s reasonably priced, especially when you consider how the bedding expands out of the packaging. It produces almost no dust, so you won’t have to worry about sneezing or long-term negative effects on your hamster’s respiratory health. It’s soft and light, so your hamsters will have no trouble burrowing and creating nests of out it. Both of which are natural activities for hamsters. 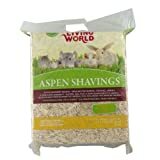 When it comes to hamster cage bedding, Aspen wood shavings are often a popular choice. Aspen is more affordable than most of the standard paper bedding options and performs well when it comes to odor-control. While Aspen isn’t as soft as paper, it’s still a comfortable choice and it shouldn’t cause any irritation to your pet hamster. Of course, not all brands of Aspen wood shavings are created equal, so it’s important to choose a trustworthy brand like Living World. Made from 100% natural Aspen wood shavings, their product is highly absorbent, carrying up to four times its weight in moisture. Most customers report that they are satisfied with the amount of odor-control and are happy with the low cost of the product. If you find other brands that aren’t 100% natural, you may want to consider passing on them, depending on what they’re made with. You want to avoid certain oils and materials that can be harmful to pets. It’s good to stick with reputable brands that have tons of positive reviews! It’s virtually dust and smell free, so you can feel confident that your hamster is safe while using this product. Aspen is a much cheaper alternative to almost every brand of paper bedding available. This is especially important if you are on a strict budget! Aspen is hypoallergenic and scent-free, so you don’t need to worry about your hamster experiencing respiratory distress. While it might not be as soft as paper, it is soft enough for burrowing and building nests. Oxbow might be popular for their small animal diets and treats, but did you know that they made bedding for small animals, too? This is a solid, reputable brand that makes excellent products (at least any that we’ve experienced first hand!). Oxbow Pure Comfort is made using 100% pure, never-printed paper, making it the perfect choice if you are worried about harsh additives or the possibility of toxic ink being used on your pet’s bedding. Customers have remarked on how soft and fluffy this bedding is, and how their pet seems to enjoy having it in their cage. Your adorable hamster will love cuddling up in the corner of their cage with a big stack of bedding, and just relaxing on their fluffy little cloud. It has remarkable odor control and efficiently absorbs water and urine. This is important for supporting the health of your hamster and for keeping them dry and clean. The brown color of the bedding helps blend in the appearance of droppings, so you can skip a day of spot cleaning here and there. It fluffs up more than similar products, making it a preferred choice for burrowing and building nests. It has never been touched by dyes of any kind – this is important for reducing the risk of introducing toxic substances to your hamster’s cage. Fibercore Eco Bedding is a popular shredded-paper bedding using 100% recycled paper and promises to be 100% biodegradable, making it a good choice for both your hamster and the environment. It boasts triple-action odor control, and is a perfect choice for hamsters, gerbils, rats, rabbits, and other popular small pets. It fluffs up well, so you end up needing to use less product to fill up your hamster’s cage. It’s also priced well, making it an affordable option for most hamster owners. If you change your cage often, the cost of bedding can really start to add-up over time, so finding something more affordable that your hamster also likes is a BIG victory! It hides odors well, with many happy customers reporting less frequent cage cleanings. It’s hypoallergenic with almost no dusty residue. Some customers have shared that their pets have sneezed less often while using Eco Bedding, and if you can actually notice something like that, that’s obviously a very good improvement! It’s light while remaining sturdy enough for your hamster to build intricate tunnels and nests throughout their cage. Unlike the other bedding choices on our list, Carefresh Custom is designed with hamsters (and gerbils) in mind specifically, rather than small pets in general. The pieces of bedding are smaller, making them easier for hamsters to burrow and nest with, and promises to keep its shape as your hamster builds. It’s designed with the unique needs of your hamster in mind, so you can be sure you are buying a bedding they’ll approve of. It’s not designed to appeal to a ton of different animals, it’s special for your special little guys and gals. Although it’s not the cheapest option available, it’s priced well with the competition, especially when you factor in the quality of it. You’re getting fantastic value for your money, and an excellent product. The pieces of bedding are small, so they are easier for your hamster to manipulate as they build a nest or burrow. This is another advantage of having it created for hamsters, when you’re using the same bedding as pet rabbits, rats, etc… the pieces aren’t bespoke for hammys. It’s soft and absorbent, so your hamster remains feeling comfortable, dry, and clean. 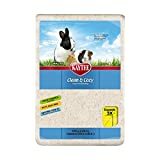 Questions about Buying Hamster Bedding? Can I use cotton bedding in my hamster’s cage? No. Using cotton bedding in your hamster’s cage is not recommended. Although it is soft and seems like a perfectly safe choice, cotton can quickly become a choking hazard as hamsters will chew and play with anything you put in their cage. Not only that, cotton is also indigestible, so it can quickly lead to an intestinal blockage when eaten. This could cause some serious harm to your hamster and could even kill them. We recommend using commercial paper bedding or aspen wood shavings in your hamster’s cage instead. Can I use Cedar wood shavings as bedding in my hamster’s cage? No. Unlike Aspen wood shavings, Cedar (and Pine!) contains harmful aromatic oils that can cause respiratory failure in hamsters and other small animals. Although most pet stores keep these products on the shelves, the dangers are well-known and should always be avoided. How often should I change the bedding in my hamster’s cage? This will depend on the type of bedding you use in your hamster’s cage, but the general rule of thumb is once per week. At this time, you should take the time to wipe down the cage and accessories with hot water and diluted bleach (about 2 tablespoons in a medium spray bottle of water) to ensure that harmful bacteria is removed. What do hamsters like to sleep in? Hamsters will usually be happy to build their own nests using the bedding that is already available in their cage. However, many owners like to provide additional materials for variety and added comfort for their hamster pals. Some popular suggestions are hay or toilet paper and a small plastic hideout for privacy. What else can I use for hamster bedding? If you don’t have commercial small animal bedding available, you can try using unscented facial tissues, toilet paper, paper towel, or napkins. Any of these options should absorb urine well but might not be as efficient when it comes to odor control. Other options are shredded paper, either using unused computer paper or newspaper. However, before you use any shredded newspaper or magazine, confirm that the dyes used in printing are vegetable-based and safe for animals. Bedding is an important component of your hamster’s cage because it provides comfort and entertainment through burrowing and nest-building. It also helps control odor while keeping your hamster clean and dry. Like with most products, it might take some time to find a bedding that works well for you and most importantly, your hamster. However, we are confident that you will find something you love from our carefully selected list of the best bedding for hamsters.